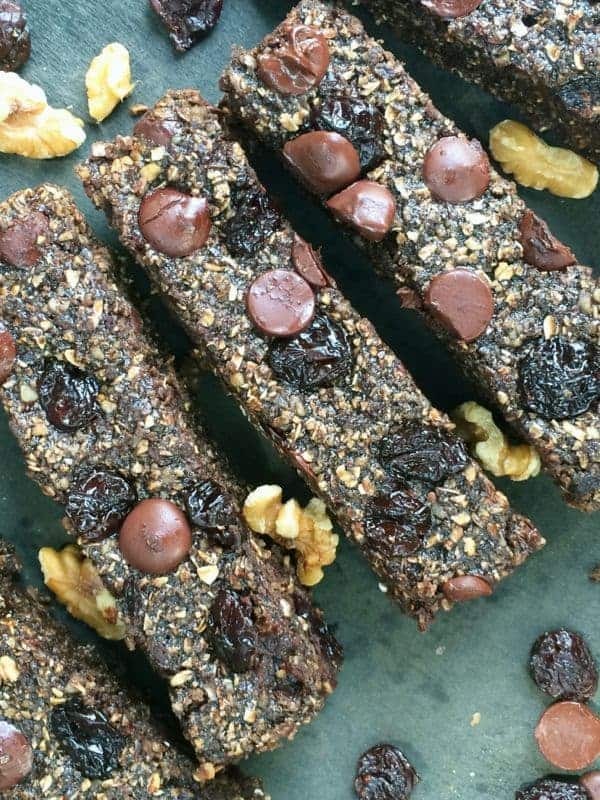 An ideal snack or breakfast on-the-go, these chewy granola bars are filled with tart cherries, dark chocolate chips and protein-packed walnuts. As though I needed one more, reason #9497214758 that I love living in Michigan is because we are the Cherry Capital of the World. In fact, I have been picking and consuming tart cherries my whole life. As a result, I was delighted when the Cherry Marketing Institute asked me to develop a cherry recipe. With a name like The Lemon Bowl, it probably doesn’t come as a surprise that I love sour flavors. Tart cherries have the perfect sweet-tart flavor that pops in a variety of recipes. Fun Fact: The same phytonutrients that give them their unique tart taste and ruby red color have been linked to a variety of health benefits – like reducing inflammation and improving muscle recovery after exercise. Even though my boys won’t be heading to the bus stop any time soon, I always find myself getting in the back to school spirit this time of year. I am a huge fan of any season that encourages and inspires people to get in their kitchen to create nutritious and delicious foods to fuel their families through these busy months. Homemade granola bars are not only easy to make but by making them at home you can control the quality of ingredients. 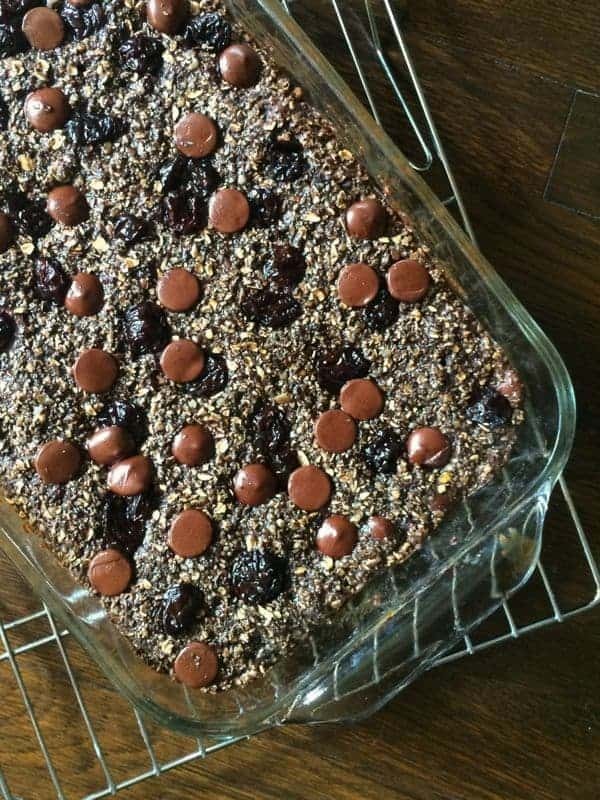 Antioxidant-rich tart cherries and dark chocolate combined with whole grain oats give these granola bars a major nutritional bang for their buck. Walnuts also add protein and heart-healthy fats to give your little ones long lasting energy, without the sugar crash. I like to wrap the bars individually in plastic wrap to throw in my gym bag or so my husband can grab one on his way to work in the morning. When stored this way in the refrigerator they will last up to 10 days. Although I’m here to warn you, they won’t last that long. Pre-heat oven to 350 degrees and spray a 9 x 13 baking pan with cooking spray. 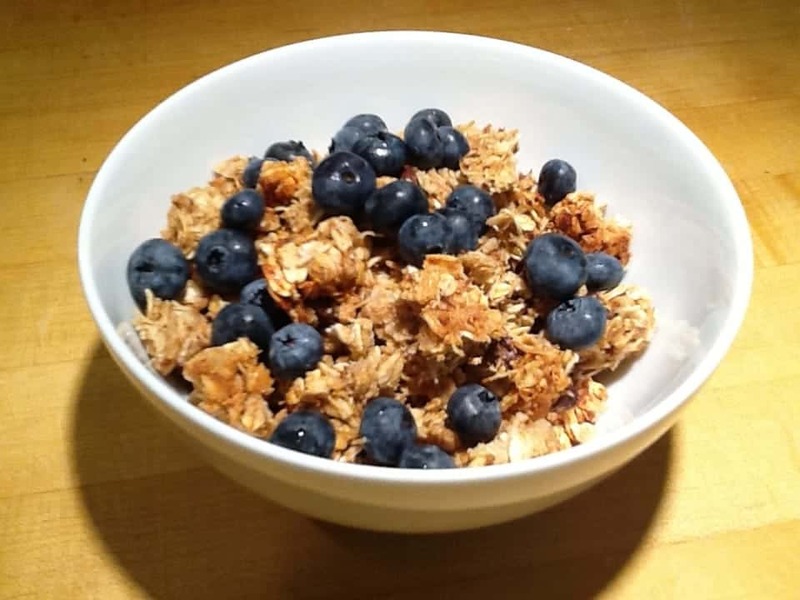 In a food processor, pulse together dried tart cherries, oats, walnuts, flax seed meal and salt until finely chopped, roughly the consistency of sand. 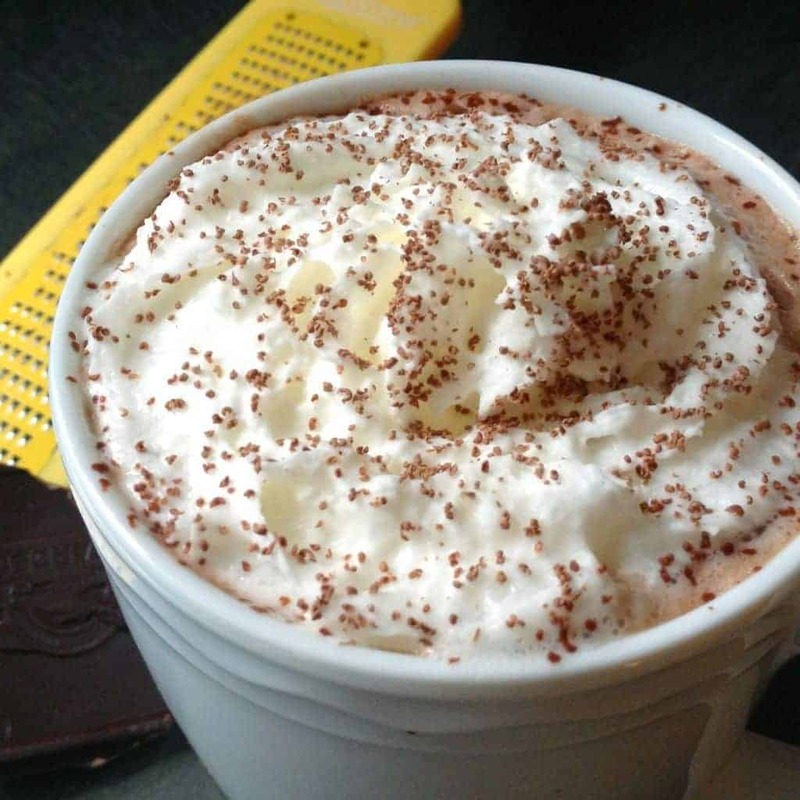 In a large bowl, whisk together eggs, honey, cocoa powder and vanilla until smooth. Add the oats mixture to the bowl and stir until evenly coated with the chocolate honey mixture. Add dark chocolate chips to the bowl and stir again. Pour mixture into prepared baking dish and spread out in an even layer. 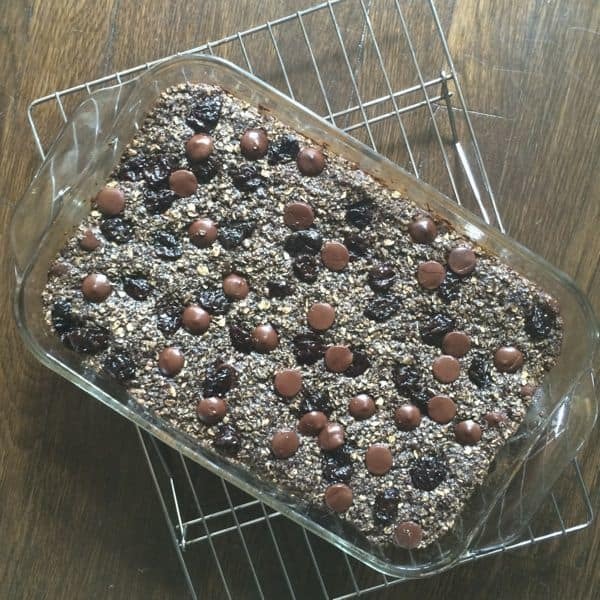 Sprinkle additional tart cherries and chocolate chips on top before baking 20-25 minutes. Let bars cool completely before slicing. While the bars will taste delicious warm or room temperature, they slice best when chilled in the refrigerator 3 hours or up to overnight. Wrap individually in plastic wrap and store in the refrigerator for up to 10 days. Disclosure: The Cherry Marketing Institute has compensated me for my time to develop this recipe. Thank you for supporting the brands that make The Lemon Bowl possible. As always, all thoughts are 100% my own. Cherries are my favorite summer treat and sour cherries always remind me of childhood. My grandma used to have a big sour cherry tree in front of her house. 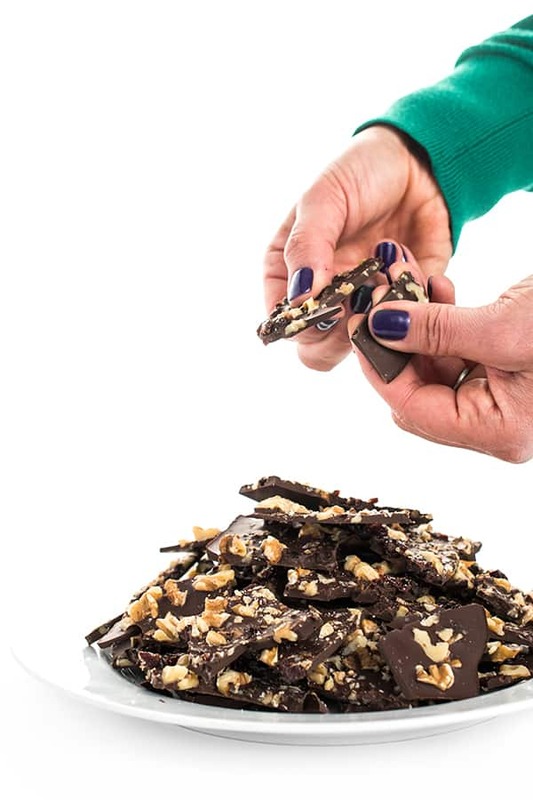 Pairing chocolate with cherries is so good and these bars sound amazing! Oh that’s so cool Roxana!! Aren’t cherry trees gorgeous? Perfect homemade recipe for after-school snacking!!! Exactly!! Also good post workout! I love The Cherry Marketing Institute! I have some of their recipe cards from a long time ago and have made several of their recipes. Anyway, I’m not a huge breakfast person, so these on-the-go granola bars would be great for me as a mid-morning snack. Aww that’s so cool you have their recipe cards!! Cherries are the best! 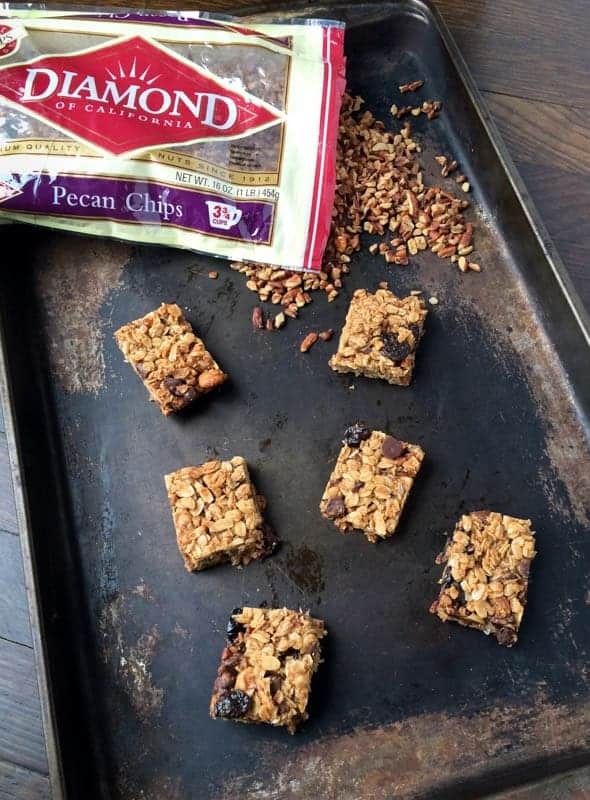 We are huge fans of granola bars! I love tart cherries and can’t wait to try this recipe! Pinned! These look amazing and I can’t wait to stock my fridge for a healthy snack! My question is – what do you recommend using to chop the first several ingredients if one doesn’t have a good processor. Just use a knife and chop up up finely? Yes just use a sharp knife – works perfectly!! Enjoy!! Not much better in life right? Thanks girl! These look and sound delish! 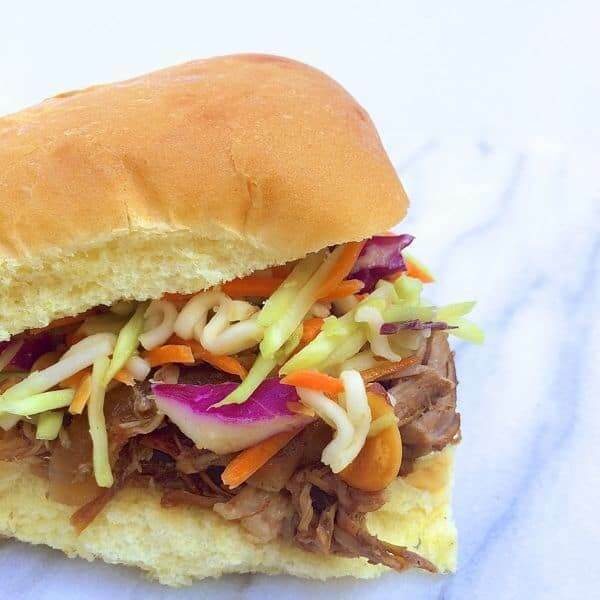 Another awesome back to school recipe, your kids must be stoked to have a food blogger mom! haha I hope they appreciate it one day! These bars look amaaazing!! I love chocolate and cherry together. Yum. You and me both! Thanks Emily! I am so making these soon. Love. Pinned! Thank you Norma- I hope you enjoy! Yum – these look perfect! We have lots of cherries in Washington too, so I had a lot of fun picking them this summer….and of course eating them! Love the dark chocolate and cherry combination! When one of my boys first went to Michigan and told me about the cherries in Michigan, I was so surprised. 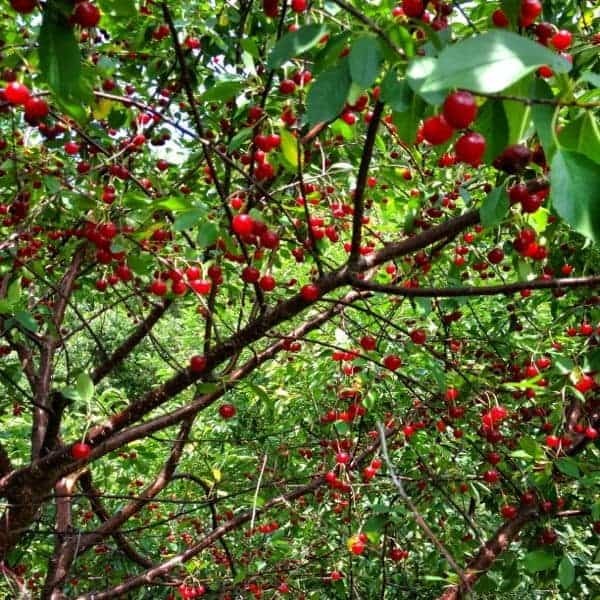 Now that I’ve got a son going to U. Michigan this fall, I know I’m hoping to get my hands on some Michigan cherries ;). Love these bars! Oh yes you are in for a treat!! So much great produce! My mom LOVES cherries and chocolate together! She’s going to love these, Liz! These look delicious! I love all the combinations of flavors and YES to anything tart! I’m a full-time college student, so these would be perfect on a rushed morning where I need to just grab something and go for breakfast :). These would be perfect for that!! They keep a long time too and are great cold or room temp. 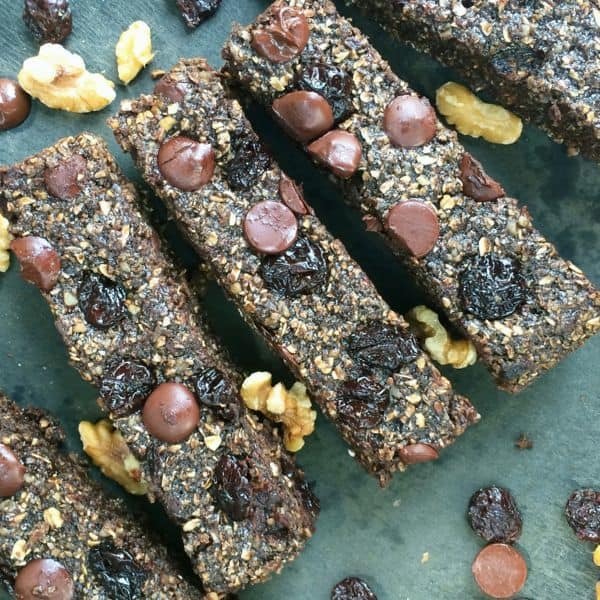 I am such a sucker for granola bars!! Enjoy! If you put this pan in front of me, I cannot be held responsible for my lack of sharing skills… YUM! haha – I am so mad I didn’t stash more away. They were literally devoured in a day. Boys. What a great on the go snack idea for any age! And I love tart cherries! Heck yes!! Snacks for all! I love tart cherries. My mom has a huge tart cherry tree in her orchard, but it died completely out of the blue last year. Finding fresh ones is so hard unless you have an in like that. Thankfully dried ones are easy to find. I am with out a doubt making these for my daughters’ lunch boxes. Oh man – my friend had one too and it also died. I really don’t think they are easy to grow as it might seem. Thank goodness for dried! Tart cherries+dark chocolate? These are just full of antioxidants! :) I love the short and simple ingredient list–I’m definitely gonna give these a try!